It all starts with a super early wake up call! Disney likes to have a nice early morning race before the parks open so that not too much traffic is affected. My friend Kat and I stayed in an on resort hotel, Shades of Green (the military hotel), which offered transportation to the race entry point. Not corrals, it seriously is a super long walk from the bus drop off to the corrals. We, meaning Kat set the alarm for 2:30 am so we wouldn't be late. Her wake up song happened to be Eye of the tiger which made me laugh! We left our room by 3:15 and boarded our bus with a ton of other prince and princesses. 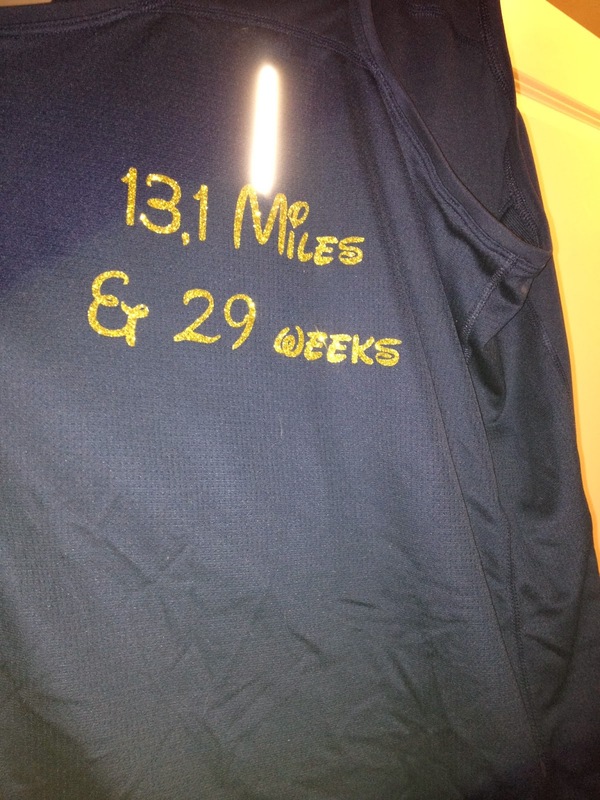 Many took notice of my shirt and were impressed that I was attempting to do a 1/2 while pregnant. That was the main comment I received during the morning. 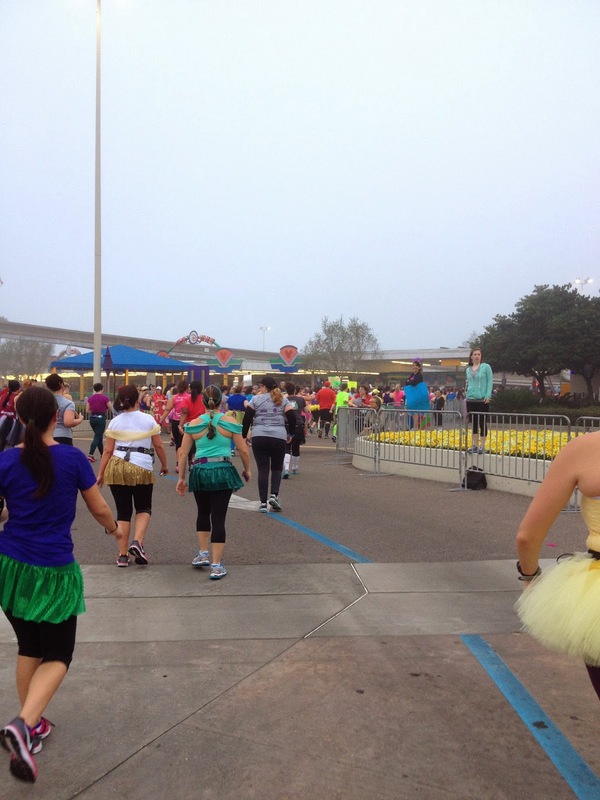 We arrived at the Epcot and started the walk to the waiting area where we used the bathrooms, port-a-potties, where a DJ was playing and interacting with all the racers. The atmosphere was pretty energetic. Everyone was super excited to get the race started. Once they opened the gate it was the walk to the corrals we go. Where I used the bathroom again before getting in our corrals. My corral, M, was schedule to start at 6:15. We arrived in our corral at 5am. It was a longish cold hour ahead of us. The morning was super humid and foggy but had a bit of a chill to it. Hoped it lasted as long as possible as my doc was super concerned about me overheating. 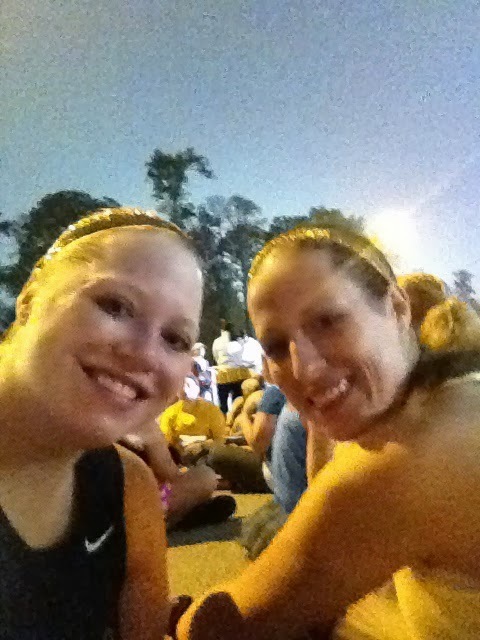 As we waited and waited we saw others jumping the corrals to the bathrooms to go one last time. Kat debated on it but decided against it. 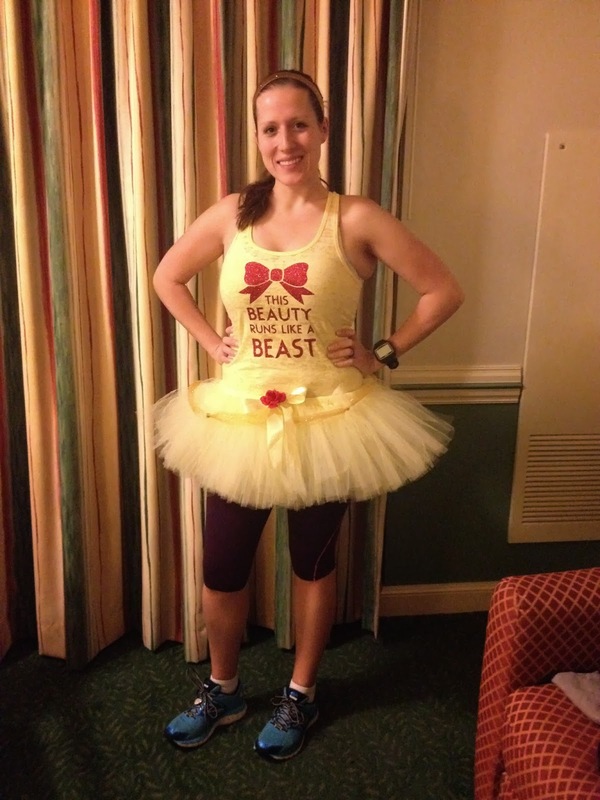 I got a comment from another racer, asking what was wrong with me for running while pregnant. 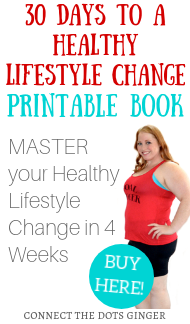 She said it quite nasty too and I just shrugged it off and said, "I'm being healthy for me and my baby." She then regaled me with experiences of her pregnancy. We finally were set to go and were off. Poor Kat had to go to the bathroom so badly at this point. (We heard that one lady just went off the side of the road within the first 80 feet of the start and had her friends blocking her go. We also saw men run to the shrubs under the monorail and just go there.) It was a long wait where we downed water. It was chill so our bodies wanted to get rid of the water and not sweat it out. So a ton of people had to go. I started out at a slow warm-up pace. I told Kat that at about 1.5 miles I will pick up but wanted a good solid warm up. Kat jumped in line at the potties at about 1 mile in and I kept going for her to catch up with me. She had to pretty much sprint to catch up because I had made it a good solid 3/4 miles without her. Just doing my intervals. I felt super strong, and the tape on my belly was helping as was my new support belt helping so that I didn't have round ligament pain as I ran. She caught up with me just after the kites flying overhead at our first overpass. 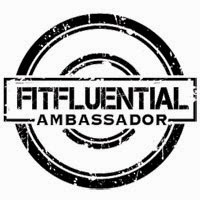 I felt so empowered because I was passing so many people and keeping a good solid pace. But it wasn't as fast as what Kat thought and she tried to hold my hand to pull me. I said, "I will not be pulled." I had to use the bathroom and had already made the plan to stop every 3 miles if needed. I wanted to wait till Magic Kingdom for my first bathroom break but I couldn't. I was keeping a solid 14:38 pace up until mile 3 where I made my first potty break. The lines were awful. 14 potties and 7 lines. As I was staining in line I noticed a couple of other obvious pregnant ladies, who I would see at every potty line from here on out. 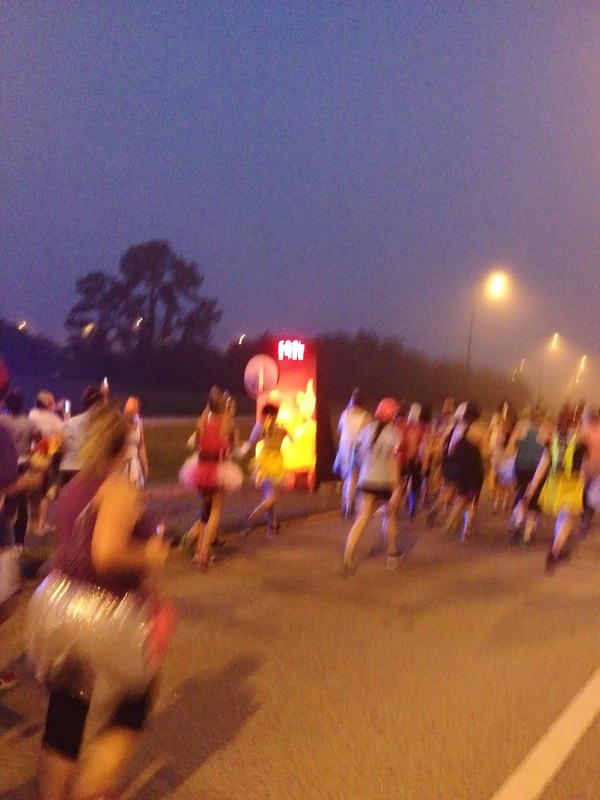 Some racers started yelling at the potties, "Hurry up! This is a race." It was at least a 5 min potty stop and at this point, I knew that I was in trouble. If all stops were 5 min and I was planning on doing 4 and I am doing a solid 15 min mile pace then I would be over the time by 5 minutes. 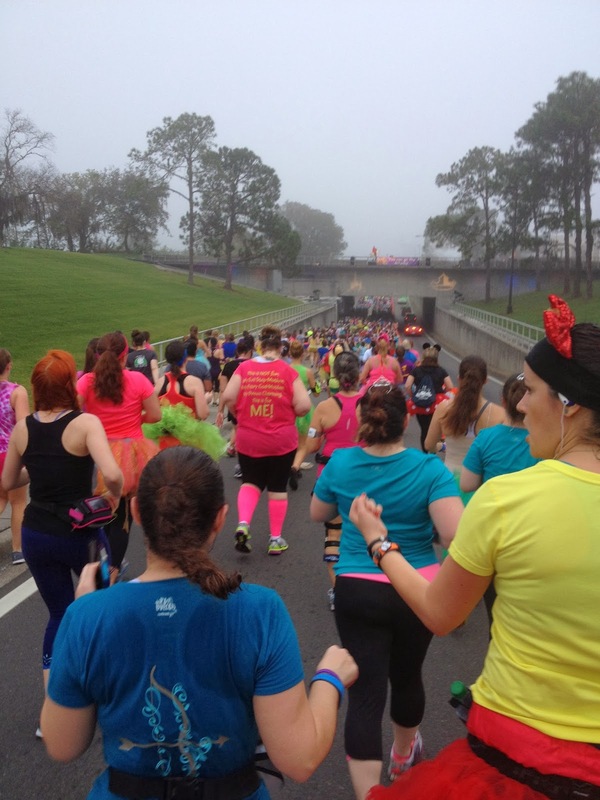 Disney advised on their site to train for a 15 min pace. This might include 2-3 potty breaks but it would not include us to take any pictures on the course. At all. 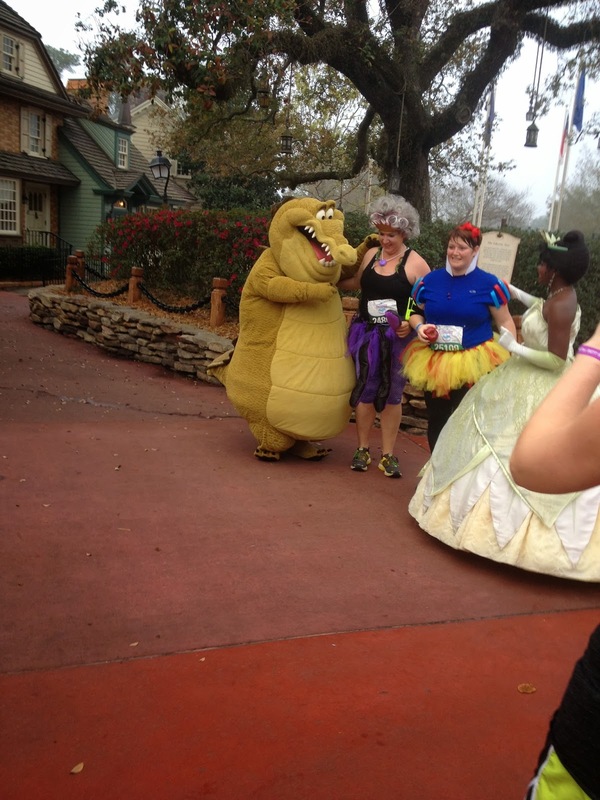 I knew going into the race that all the lines for the characters would be long and that I wasn't going to take any, unless I saw the alligator from Princess and the Frog. (I love alligators) But still that takes away some of the fun of the race, not being able to take any pictures because the lines are so long and if you did stop, then you would be stressed about taking a faster pace and burn out before the end of the race. Plus being in the back the concern is all about the Blue Balloon Carrying Sweepers! 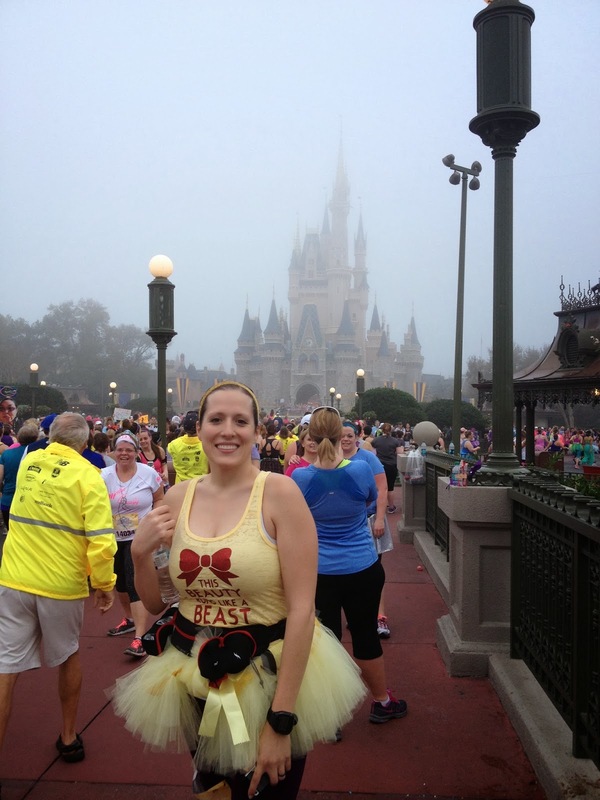 I ran back to Kat and adjusted my tutu back down and in place and we took off. 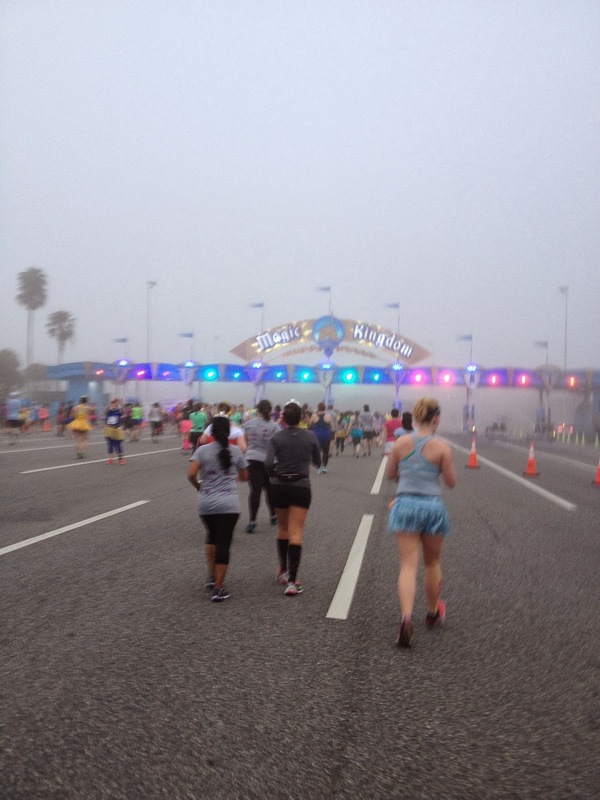 Before I knew it we were running under the fogged out Magic Kingdom sign. As we were entering the transpiration area to MK another lady was already saying that she couldn't do this. AT ALL. We told her, she could and she was doing great. Just wait for Main street and the crowd and cheers and she will get the buzz in energy she needs to finish! I also at this point passed the lady who made the comment to me earlier of what was wrong with me. I ended up staying in front of her for the remainder of the race. (made me feel pretty good knowing that I was passing people) We went under the overpass with the guy dancing with the HUGE Mickey hands having fun. There were so many people crammed in this area. The course narrows quite a bit and it felt like quite a squeeze to get through. We were going down though and I told Kat, go! And we just ran down avoiding people as best as possible. As we were backstage I knew where we were from the Keys to the Kingdom and I started to get teary eyed because I was about to do the one area I was looking forward to the most. 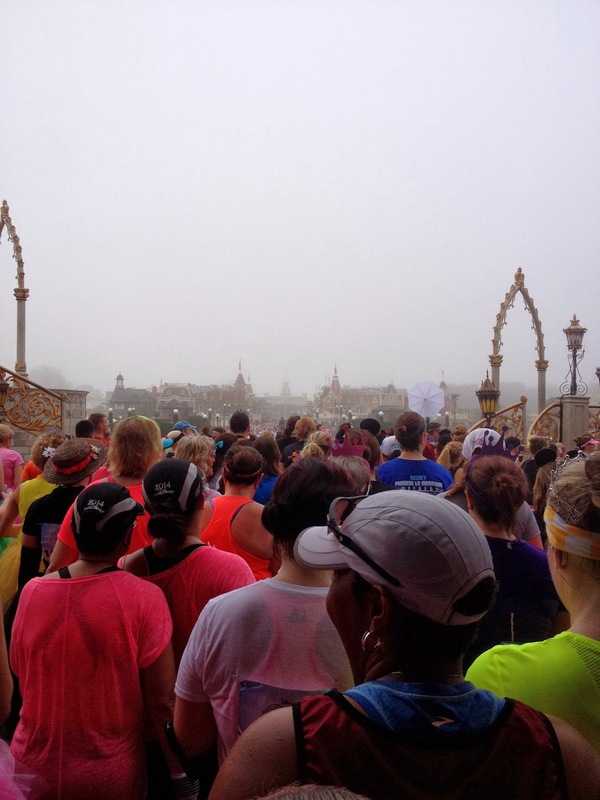 Running through the Magic Kingdom. 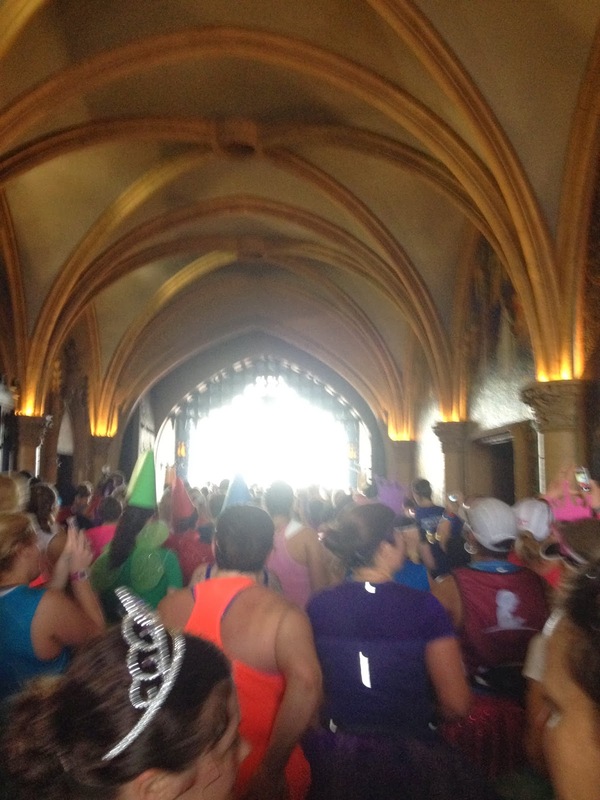 I had seen so many pictures from other bloggers about the crowd cheering you on, space and being able to run through the castle. 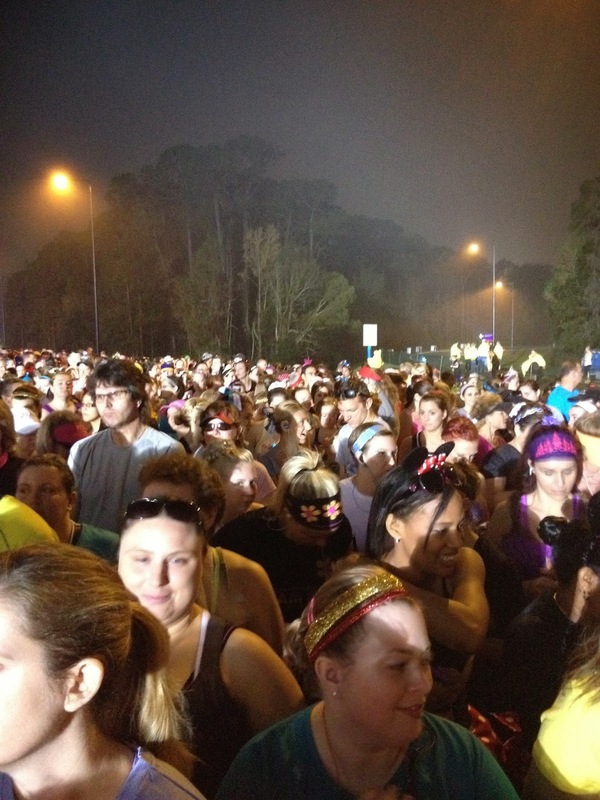 Before we entered the MK we had quite a few bottleneck have to walk areas because there was such a large crowd. 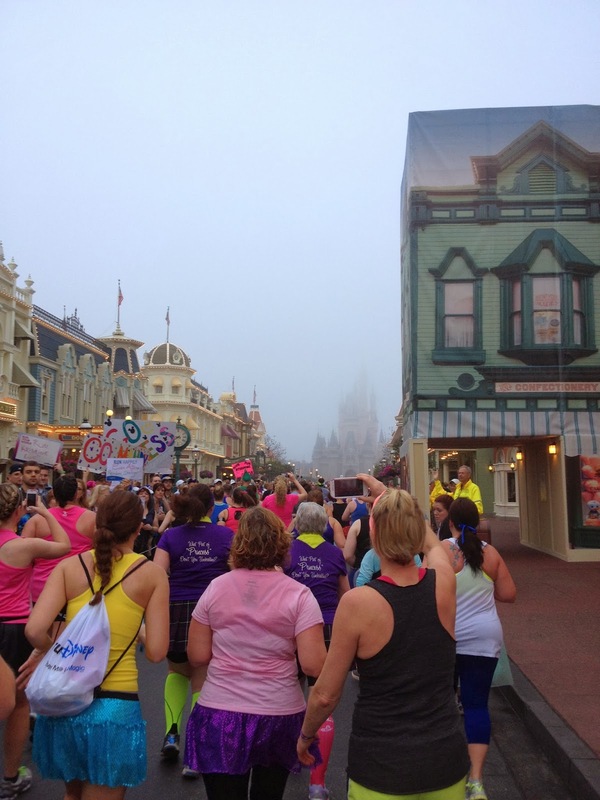 As we started to round the corner onto Main Street, we came to a halt! WHAT! It was so tight and packed with people that it was walking speed only down Main Street. Kat and I jumped up to the sidewalk so that I could run through Main Street. We stopped for a second to take our pictures in front of the castle. Then continued. We stopped in tomorrow land to use the bathroom which this stop was the fastest of all. The mens restroom was being used by women but there aren't as many stalls so their line was slower. We joined the mostly walking pack and made our way to Fantasyland where we rounded the turn and came to a halt again. 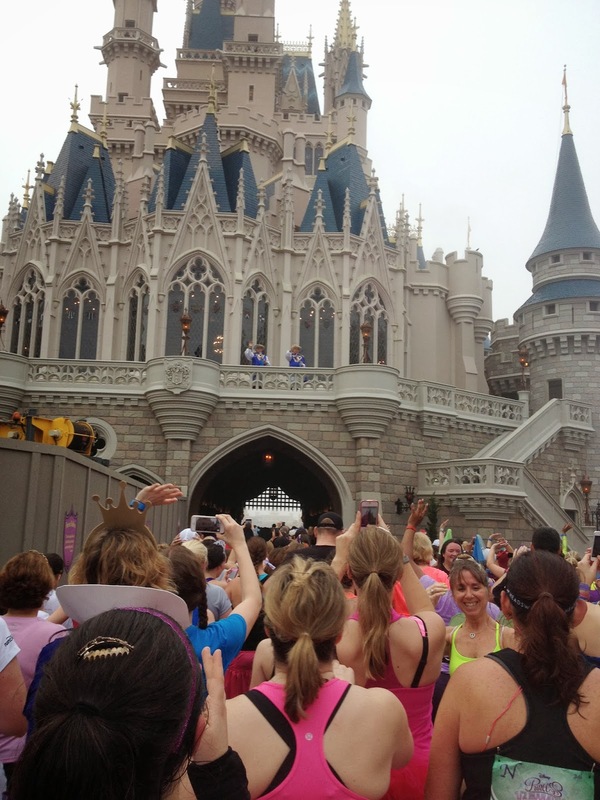 My dream of running through the castle crushed. There were so many people that we were cramped and slowing waddling our way to and through the castle. The trumpeters welcomed us to the castle with their fanfares. I remember thinking, I hope they don't empty their spit valve on us as we pass under. (Ah the things a musician thinks of) And we slowly made our way through the castle. SADLY walking. 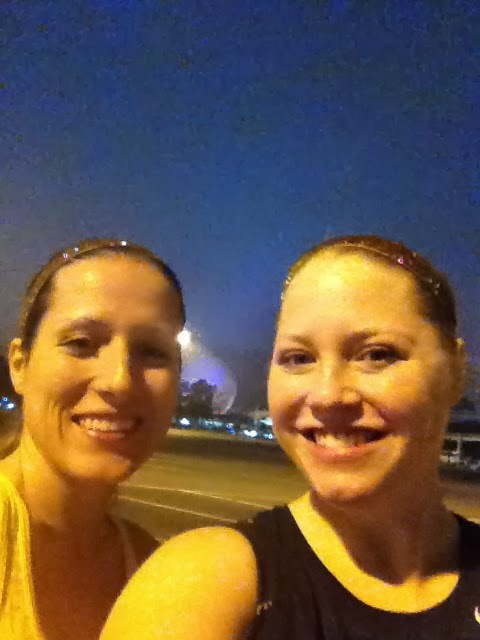 As we exited, Kat and I knew we had to go, so we tried to run as best as possible down the ramp and out tomorrow land. We made our way past Splash Mountain where my feet were starting to feel loose in my shoes. At the corner getting onto the 6 mile stretch of highway I stopped to tighten my shoes. BAD IDEA! I tightened them too much and the tops of my feet hurt so much for the remained for the race. We passed mile 7 with the anthem of Let It Go by Frozen which totally didn't fit the race at all. It's a good song but it doesn't fit the idea of running. I wish that I were freezing. At this point the sun was burning away the fog and it was starting to heat up and get more humid. Kat had me drink water and power aid at every stop. It also felt like they had more water stops along the way, I felt like I was always drinking. Two days before the race, Disney advised of the heat, so maybe Disney set up more water stops for that reason. I did not want to be pulled from the course. Medics were on bikes passing us. Again anytime they passed me I threw a smile on my face and acted that everything was fine. I just could not stop. That was my mantra, DON'T STOP! I told Kat that I hurt, and I had to keep going and I couldn't go any fast at this point. She said I had to and kept pulling me. I looked at my clock. I should have been done by this point keeping my 15 min mile pace. I was bummed. I wanted to be done, finished with the race, I was going to finish it though. We entered the parking lot area and I started to lose it. I could not stop crying. I was so excited that I had done this. I knew I was going to make it. I hurt everywhere. 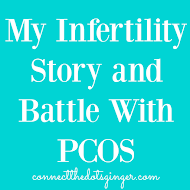 I was having Braxton Hicks contractions and had to slow my pace down. We were passing potties again and I had to go. Mile 12 and I had to go. I was almost done but I stopped. No lines though which was nice, but my body was so sweaty and my clothing was so stuck to me it took forever to get the shorts on and off. Got back in the pack and one lady said the sweepers were right behind us. I knew I was a good mile in front of them and didn't really believe her but I pushed and did little sprints in with my walks. We passed through the crowded Epcot with lots of cheers and made the turn just in front of the lake. One of the pregnant ladies that I saw at every potty break was running next to us and then she passed me. GO HER! We passed by the choir, I didn't really hear them though because I just wanted to be done, I was almost done. Then we made the next turn and there it was. The finish line. I was a mess inside. I was almost done. I was balling. I can't believe that I actually did this. I did this! 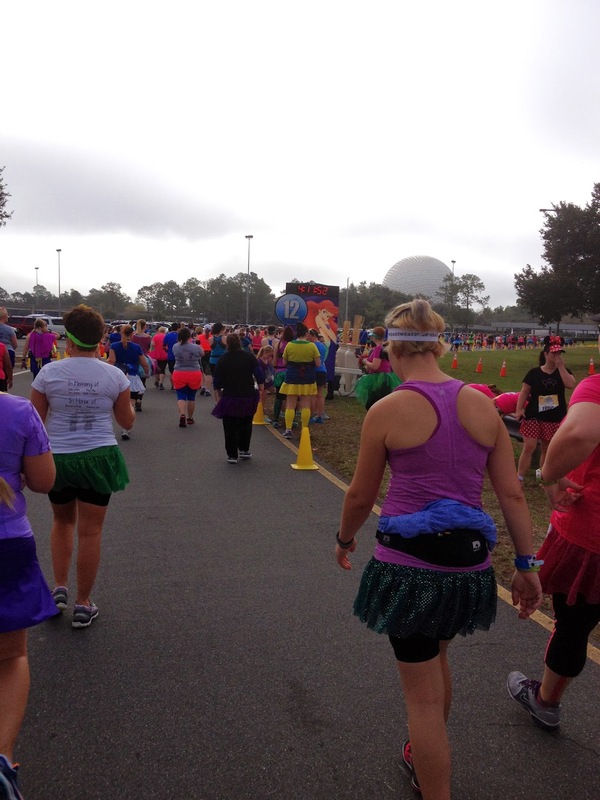 I ran right past Mickey, I had planned on stopping to get a hug but I wanted to be done! I totally dissed Mickey though. Bad Becky. Finally we crossed the finish line hand in hand. I was upright and balling my eyes out! I finally could slow down my walk and the Braxton Hicks finally went away, thank you. They handed us this cool cloth that Kat put on my neck. I wanted to see my family. We made our way back to the family reunion area, but first I got my medal. 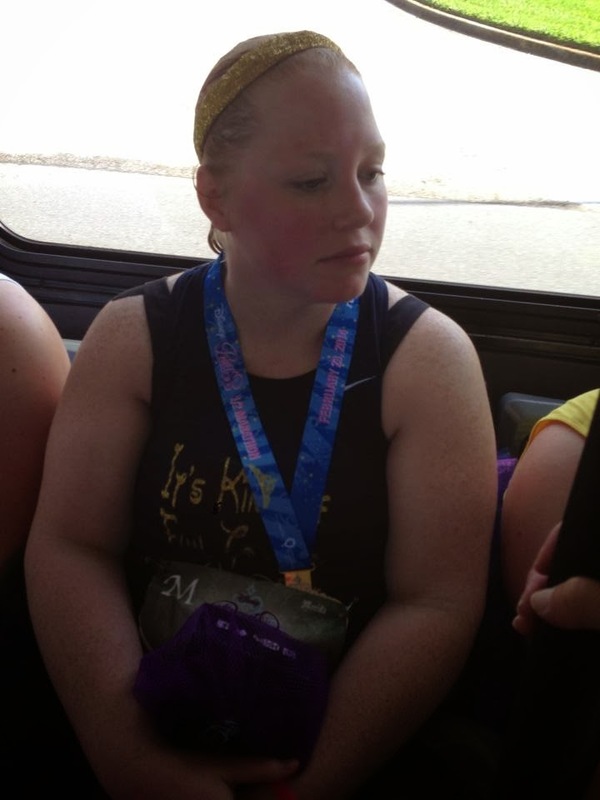 (Never got a post race pix of me all sweaty and my medal.) I saw Matt and ran into his arms crying my eyes out so thankful to see him and know that I survived. I did it. He didn't know if I was doing a good or a bad cry. He was so confused but so happy and proud of me. Mace was kind of asleep but then woke up and wanted to give me a hug too. I picked him up and carried him for a little bit. Kat and I couldn't celebrate much longer because we had to get checked out of our room cause check out was 11 and it was like 10:30 already. The busses were thankfully parked very close to where the reunion area was. I WAS SO THANKFUL! We got back to our hotel and changed and showered and the boys met us to pick us up. I kind of rested for a little bit and took off my shoes. My feet hurt so bad. No blisters that I could see. Later that day was kind of a blur. I took a bath to soak my legs in, fell asleep in there. Went to my bed and slept as Matt and Kat checked in on me every now and then to see how I was doing. Kat and her hubs brought me a burger and I didn't realize how hungry I was until I took my first bite of fries and I in-hailed the burger. Then slept for pretty much the rest of the day. No parks for me. 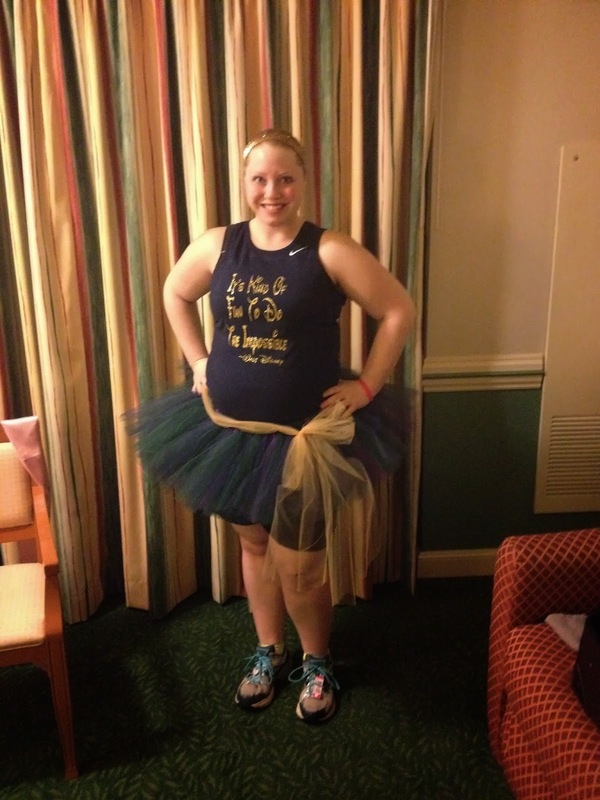 ~DO NOT SHAVE YOUR INNER THIGHS the morning of the race. I not only had chaffing but it turned into a razor burn chaffing. I used vaseline and body glide there too but the razor burn with the chaffing, not good! I also had a little chaffing from my support belt but that was ok.
~I did have 3 little blisters on my feet just where the tape line ended. Maybe 2 layers of tape a little thicker on my feet would have been better. ~Disney needs more port-a-potties. Either more at every stop or along the way. There were too many of us and the lines were far too long which affected my official completion time. I was actually upset for the first few days after because I feel like I failed. But in all honesty I was keeping a solid under 15 min mile pace up until mile 10.5. Then I slowed because my body couldn't go faster. ~Do not tighten your shoes mid race. Unless they untie themselves don't touch your shoes! My feet hurt because I over tightened them. ~For those of us in the back of the race we need more space on the course. There were so many bottle neck areas that we had to come to a standstill and just slowly walk through areas. That affects time. But this gives me more incentive to get my running better to make it into a faster corral next time to avoid the overcrowding. 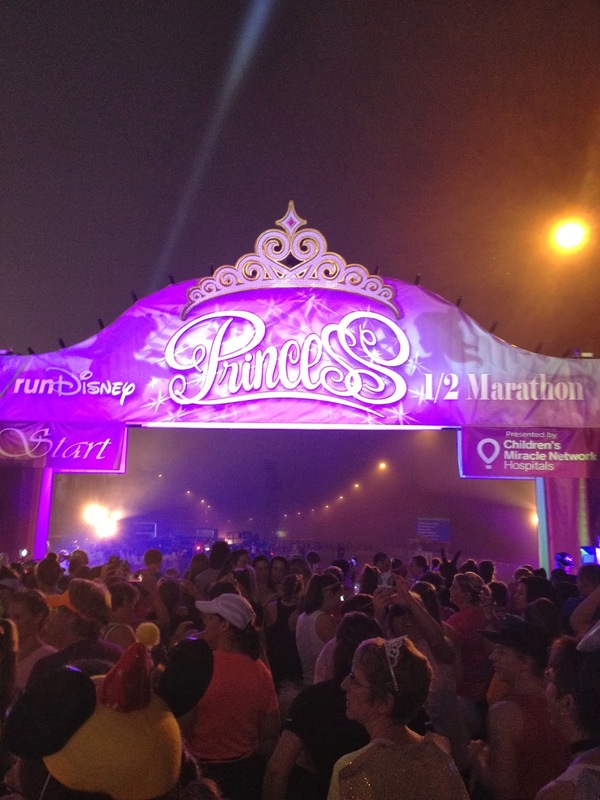 I had a great experience with my first 1/2 marathon and at Disney. It was great! During the race I was miserable and hot and I hurt. But that's not Disney's fault. 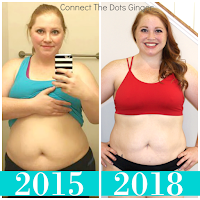 I was 29 weeks pregnant. I was pushing myself physically and mentally. The last 3 miles of the race is all mental! Will I run a 1/2 again. Yes, but never while pregnant, ever! Right now I am thinking about the Wine and Dine in 2015. I actually have wanted to run that race for awhile! 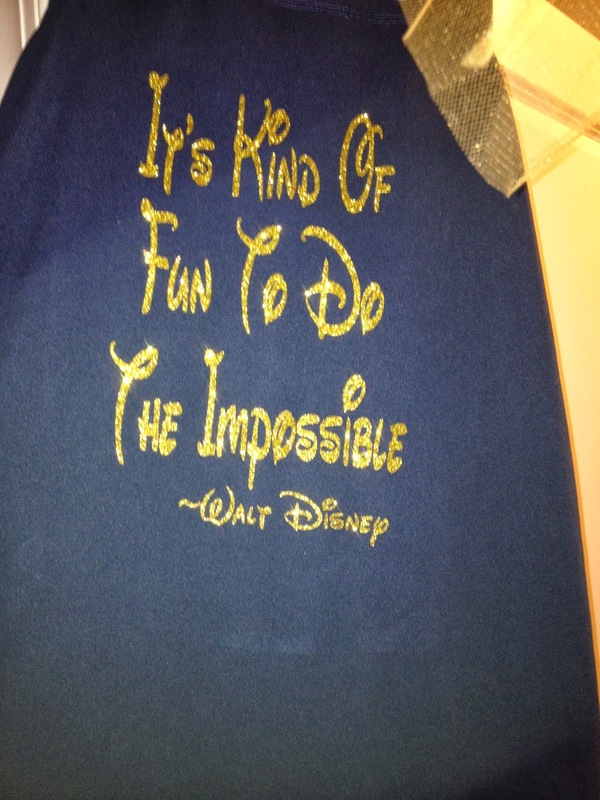 And eventual I would like to train for the Goofy challenge. That is my overall goal but not for awhile. I have a long way to go before that point! WHEW! Did you make it to the end! I told you it was long!